Follow the process as psychology and architecture classes join forces to design and build furniture for their high school's new learning spaces. Project-based learning, maker lessons, and hands-on learning are all the rage in elementary and middle school, but can high school teachers do these projects within the confines of curriculum coverage, time limits, and disciplinary silos? 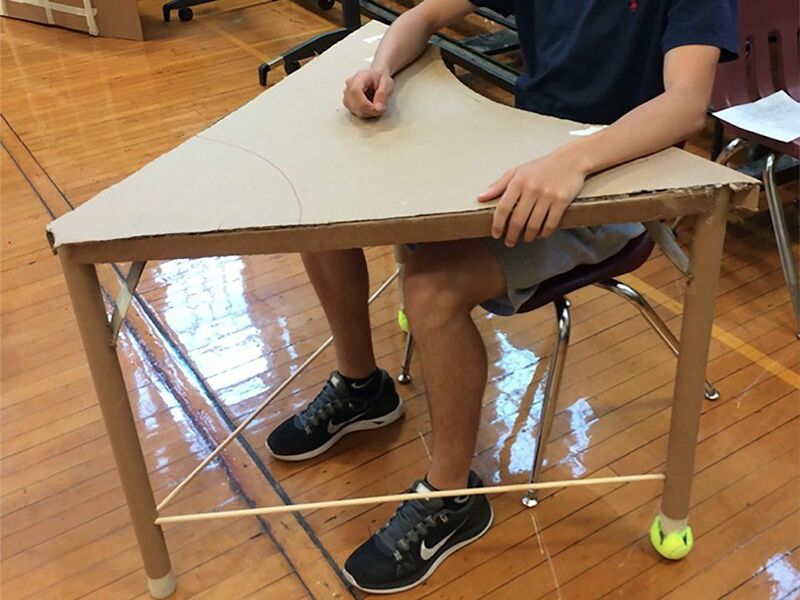 At Scarsdale High School, psychology and architecture classes joined forces to design and build furniture for new learning spaces. It started with a conversation around embodied cognition and space. Our school has plans for a learning commons, which is a perfect opportunity to get students involved in designing a working/learning space. It's a problem that is relevant to them, as their peers will be the beneficiaries. Real problems are not constrained to distinct disciplines, so we asked students to look at embodied cognition from the perspectives of both architecture and psychology. We crafted a simple prompt: Design an ideal workstation for students that reflects how students work (read/study/research/write) today. We used design thinking as a scaffold, and mapped out the project. a. Interview users about their experience with working/learning spaces. b. Dive deep: think about how the users feel. c. Reflect on personal experiences. d. Use Agency by Design's Think Feel Care routine (PDF). e. This step will take three class periods plus homework. a. What are the issues with our current working/learning spaces? b. Create a problem statement (such as, "How might we. . . ?"). c. This step will take one class period. a. In five minutes, think of as many solutions for your problem as possible. b. Choose one or more to prototype. c. Bring in experts to guide the students. d. This step will take three class periods. a. Return to users for feedback on the prototype. b. Does this prototype solve the problem? c. This step will take one class period plus homework. a. Incorporate feedback into your prototype. b. This step will take two class periods. a. Now that you've received feedback and reiterated your piece to reflect that feedback, build it -- life size! b. Sketch it out on big paper. Continue to test by asking, "Does this work? Do we need to make adjustments?" c. This step will take five class periods. a. Present your design to a panel, which includes the principal, teachers, experts, and other administrators. Real audience members add authenticity. b. This step will take one class period. a. Review the experience of using design thinking to work with real users and real problems. b. Consider the process of building and reiterating. Was it frustrating when something didn't work? c. How can we redefine failure? d. What did the homework involve, and how did it help? The preceding calendar represents our schedule, but these projects can be abbreviated or stretched depending on time constraints and scale. 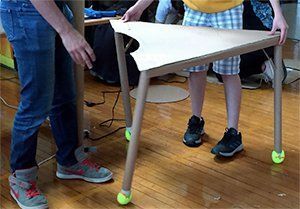 Neither of us had ever designed or built furniture, so former students served as our experts, working with current students, critiquing their ideas, and offering resources. Experts can be parents, former students, colleagues, or even individuals that you've cold-called. If you let people know that you need help for students tackling a real-world problem, they are willing to help. Throughout this process, students were researching content. In order to answer the question, psychology students learned about the relationship between space and work. What psychological studies have been done on learning? What were their results? Architecture students examined the sensory elements of physical space: light, sound, and touch. They considered scale and materials. As students went from small models to full-scale furniture, they became aware of problems. Tables weren't the right height, single legs wobbled and needed support, and parts of their designs had to be reworked. Actually building the full-scale prototypes gave them a physical relationship to the pieces that they didn't have during the model phase, and the materials in their hands gave them some very real feedback. So how do you tackle real challenges in your own classroom? Find areas of overlap with other disciplines, and brainstorm with those teachers. Working together can spark great ideas and offer support as you try something slightly scary and new. Then find a problem that students can relate to, is local in nature, and is important to their lives. And then set them to solving that problem.